Nepal sails to finals in Women’s T-20 Smash Cricket Tournament - Integration Through Media ....! 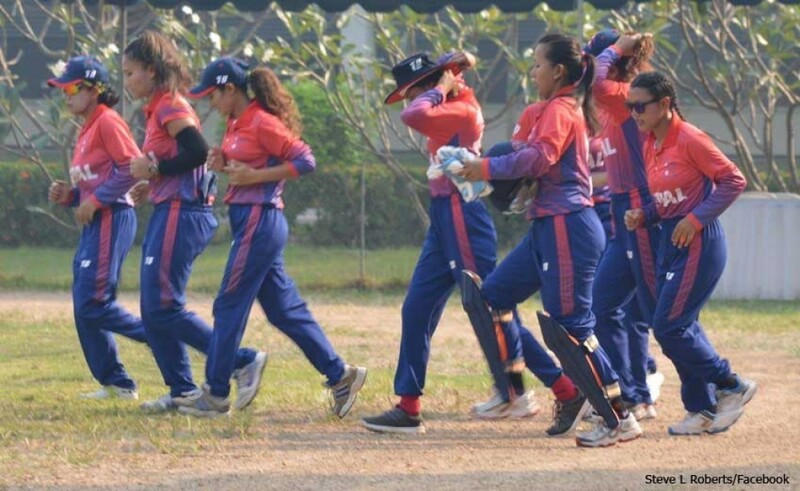 KATHMANDU: Nepal has entered the finals of the Thailand Women’s T-20 Smash Cricket Championship, defeating Indonesia by 92 runs in the semi-final. Indonesia, which was chasing a target of 120 runs, was all out just at 27 runs. Except opener Ulia, who made the highest 13 runs for Indonesia, other Indonesian players could not make double-digit runs. Four Indonesia players could not make any runs. For Nepal, skipper Rubina Chhetri took three wickets while Kabita Kunwar, Neri Thapa, Sita Rana Magar and Sarita Magar each took one wicket. With this win, Nepal has become the Group ‘A’ winner and made it to the finals. Indonesia had become the first runner-up of Group ‘B’. Indonesia had lost its first wicket when they had made 11 runs. It lost the second wicket at 19 runs and lost all eight wickets in the course of making as many runs. The 91-run win is the Nepali women international team’s victory with the widest run difference. On the basis of wickets, Nepal had defeated China by 10 wickets. The 48 runs that Sita made is the highest individual number of runs collected by any Nepali woman in the T-20 International Cricket Championship. The 27 runs Sita made before this in the match with UAE was the highest number of runs made by individual player. Nepal, sent to bat first after losing the toss, made 120 runs in 20 overs, losing three wickets. Sita Rana Magar performed a brilliant batting and amassed 48 runs for Nepal. Similarly, Kajal Shrestha made 14 runs and Indu Barma was 37 not out. Nepal will be pitted in the final on Saturday against the winners of the second semi-final match between Thailand and UAE being held today. Nepal, which reached the semi-final after outstanding results in the group round, had defeated China by 10 wickets in the first match, Malaysia by six wickets in the second match, the UAE by six wickets in the third match and Thailand ‘A’ by nine wickets in the last match under the group round matches.